For many people, being a black belt is a great goal and achievement, and the result of hard work and commitment. It is not an easy mission to earn a black belt especially if the test was so strict and evaluating each corner of Taekwondo basics. During the old days, the black belt was a biggest dream for many martial artists because the black belt holder gets some respect inside the dojang and outside of it. Even in kyorugi championships it was so scary for color belt holders to spar against black belts, because black belts that time were strong fighters comparing to this new generation, and masters were so strict with their students about the belt tests. Now things are different, and it seems that some Taekwondo masters became brokers between the costumer (Student) and the shopping mall (Kukkiwon or whatever taekwondo organization). I did not want to describe it this way, but maybe the reality is worst. It would be acceptable if your master or grand master evaluates you and be convinced that you deserve that black belt. The fact that you train under your master guidance for years permits for him/her to test your taekwondo techniques and also morals. In case your master was not qualified according to Kukkiwon rules to test black belts in the dojang, then sending the students to other sides, such as national unions or kukkiwon should be a prove that the students have met the criteria required in both taekwondo skills and morals. This is to divide taekwondo black belts into two categories according to their age; the Poom was made for black belt holders under 15 years old, while the Dan is for people above that age. Students under 15 years old would be legitimate to test for the first Poom, the second Poom or the third Poom, without ignoring the period that must be respected between the last poom issue and the next test. When students get older than 15, it would be possible according to kukkiwon rules to convert the Poom into a Dan certificate. Are Taekwondo skills the only criteria needed to be a black belt holder?? Well, for business-masters, the taekwondo student is like a costumer, and the real focus is on money. Whenever you go shopping, you can see that you do not need to be qualified to buy a certain item! This simple analogy explains everything. To be qualified for a black belt test you have to reach a certain level of maturity and also to master the basic techniques of taekwondo. 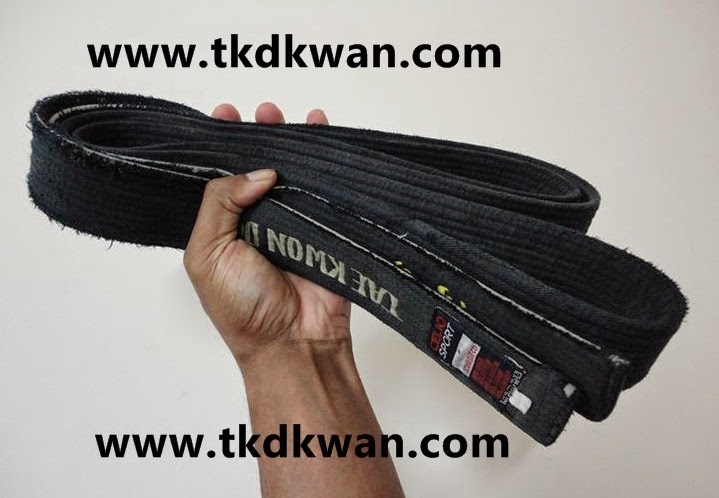 The student must range in color belts and has to respect the period between the last belt and the next test, because it is not right to be a black belt after a short time of practice. The good commitment and hard work in the dojang are not enough to be qualified for your first Dan, but also time is needed. A first Dan black belt who kicked 10,000 kicks is of course much better than the one whom kicked 5,000 kicks. MORE PERFECT PRACTICE MAKES YOUR TAEKWONDO PERFECT. Every kick, punch or a block you execute will improve your performance in the future, just keep kicking, and do it correctly. I hope this small article does not bother anyone of the readers. In my club (www.mudo.fi) 1st Poom and Dan, minimum 4,5 years if You are over 12 ages (Poom), 15 and over 1st Dan. But then You have to be talent ad wery active. Even kids start 3 year ages the can not get Poom before 12 ages. We have rules that we don't give 6 kup under 7 years ages, 3 kup under 9 years ages and so on. In test is same for poom and dan, only breaking is 1 cm strong wood for jirugi and 2x1cm to chagis. Have to do Poomsaes 1-8 Tuguk, sparring against one and against 3 opponent, hosinsul 10 different attacks, 4 different tyo chagis (jump kicks), and more. But also show respect to others in training, to in streetbehavion /school/work, . . . . have to show inner strength, to provide assistance to others, be able to teach others also, and much more. I agree and luckily my teacher too. When I asked if I could do the black belt test, he told me that it was not just a matter of practice time ... I took the exam after a third place in a national combat championship and a first place at the regional championships ...what a great teaching and what a great teacher...I still work on basic techniques to earn/deserve the fifth dan. thats very true. im a red two stripe. we have gradings so each belt level has something new added. and you get greed out of 5. we r all compared .which puts pressure on us students. I have been trying to do that but local Kukkiwon reps didn't seem interested. With respect, I think you mean "consumer" rather than "costumer". Nice article . Taekwondo is a marathon not a Sprint race. There is no hurry for grades. And as Vesa said, I too have delays in grading depending on the students age . Well, it seems now that a kukkiwon/wtf BB just needs more money.